High Power Laser Therapy offers patients a painless, non-surgical and side effect free treatment for conditions previously refractive to traditional medical care. Conditions such as peripheral neuropathy, head, neck and back pain (stenosis, disc herniations and sciatica), arthritis, carpal tunnel syndrome, foot and heel pain, ligament and tendon injuries, muscle bruising, and even non-healing wounds, to name a few, all respond well to high power laser therapy treatments. Traditional medicine uses drugs and surgery, and you are still sitting there in pain. And while they are busy managing your pain, we are relieving pain by stimulating the body and allowing it to heal itself with the assistance of the high power therapy laser light. The laser treatments also accelerate wound healing and is an excellent adjunct to accelerating healing post surgically as it can significantly reduce recovery time over traditional therapies available today. Patients who have undergone joint replacement can cut the rehab process by as much as 50% and more. Their pain and discomfort will quickly be controlled and the need for dangerous narcotics can be eliminated within a few treatments. Your pain free life can start as soon as we can determine your specific needs. All clients who come to our clinic for evaluation and treatment will first receive a comprehensive neurological, orthopedic and bio-mechanical physical examination. We will then discuss your condition and whether or not you can benefit from HPLT. No Drugs. No Surgery. No Pain. High power laser is a non-surgical option that truly has the power to eliminate or significantly reduce your pain. Five to ten brief treatments with this powerful laser is all it takes to realize life changing results. Our Class IV laser works by flooding the tissues with photons, energizing the damaged cells and increasing circulation to the painful area. This produces a cascade of healing responses in your body, reducing inflammation, thereby reducing or even eliminating your pain. 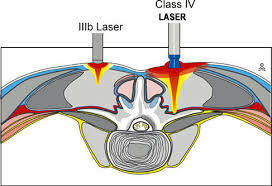 The Class IV laser (approved by the FDA in 2006) penetrates deeply while remaining non-invasive. Used to treat the same conditions as the cold laser, the Class IV is capable of reaching depths of 6 to 9 inches, with a treatment beam of up to 3 inches. Because the Class IV laser reaches deep into the tissues, it is ideal for treating sprains and strains, arthritis, calcified muscles and fibrotic adhesions, as well as intra-articular tissues inside of the joints. Its far-reaching capabilities also allow the Class IV to achieve results in less time than a cold laser. With treatment times of as little as 5 to 15 minutes, the Class IV laser allows many conditions to vastly improve within a few visits. Oftentimes, patients find immediate, soothing relief that improves with each session. Contact our office at (01) 642-5911 to schedule an initial consultation to determine if your clinical case is suitable for laser or spinal decompression therapy. You may also bring recent copies of x-rays or MRI films or reports to help evaluate your case. After answering any questions you may have about the recommended plan, you may begin your case. Decompression Ireland © 2018 All Rights Reserved.